An important catching device is the Heligoland trap (Fig. 1). Originally it was constructed on the German island Heligoland. The general layout of the trap is a funnel made of net ending with a box or a collecting room from where caught birds are removed. Constructions are permanent or temporary and their size varies to a large extent. Original traps made on Heligoland are small (around 3 m high) while the biggest Rybatchy-type ones reach heights of 20 m.
Big Heligoland traps work as basic catching device in coastal regions of Russia, Estonia, Latvia and Lithuania, in the interior of Ukraine and in Kazakhstan on mountain passes. 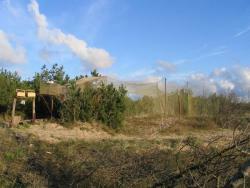 A particular design of Heligoland trap, a so called "zig-zag trap" is used at the Ventes Ragas station in Lithuania. Movable big traps were used at the Operation Baltic stations as a supplement to nets.